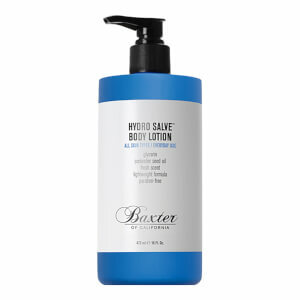 Catering specifically for men, the Baxter of California Hydro Salve Body Lotion can be used daily to soften and condition skin, without greasy or sticky residue. Harnessing the powers of Glycerin and Coriander Seed Oil, the rich, lightweight formula absorbs quickly to deliver long-lasting moisture and hydration, leaving skin feeling smooth and replenished with the brand's signature citrus and herbal-musk scent. Can also be applied on the hands, or used as tattoo care to enhance vibrancy. Apply liberally to hands and body. Can be used on tattoos. Aqua / Water, Paraffinum Liquidum / Mineral Oil, Glycerin, Cetearyl Alcohol, Dimethicone, Aluminum Starch Octenylsuccinate, Stearic Acid, Phenoxyethanol, Palmitic Acid, Parfum / Fragrance, Polyacrylamide, Cetearyl Glucoside, C13-14 Isoparaffin, Xanthan Gum, Benzoic Acid, Sodium Hydroxide, Coriandrum Sativum Seed Oil / Coriander Seed Oil, Laureth-7, Linalool, Myristic Acid, Limonene, Citronellol, Geraniol, Benzyl Alcohol, Eugenol, Coumarin, Hydroxycitronellal.